Gold Leaving US Vaults: Signs of Upcoming Currency War and Armed Conflict? This is a dramatic move reflecting an international trend. Venezuela repatriated its gold from the US in 2012. In 2014, the Netherlands also retrieved its 122.5 tonnes of gold that were stored in US vaults. Germany brought home 300 metric tonnes of gold stashed in the United States in 2017. It took Berlin four years to complete the transfers. Austria and Belgium have reviewed the possibility of taking similar measures. 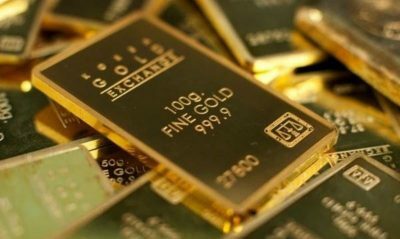 The gold bars that the US claims to hold are of low purity and do not conform to international industry standards. Even if the US has the amount of gold it claims to have, most of it would not be acceptable for trading on the international market. While other countries are pulling their gold out of the FRS banks, Russia and China are boosting their reserves, creating gold-backed currencies for themselves and thus moving the world away from the dominance of the USD. The US dollar’s status as the global reserve currency has been called into question. It faces some tough competition. The tariffs introduced by the US administration as an instrument of coercion against other countries are failing to bolster the greenback, which may soon face headwinds. An international currency war looms as a possibility. This makes investors look for other options. Indeed, why should other countries rely on a US dollar that is not backed by gold or anything but “the good faith and credit of the American worker,” when America itself is not trusted internationally? For instance, the Chinese yuan is going strong. Russia, Turkey, and Iran are considering the prospects for making payments in their national currencies. Iran has recently announced it is switching from the dollar to the euro as its official reporting currency. Russia and China have a currency swap agreement that avoids settlements in the USD. The quest to reduce dependence on the dollar was provoked by the ongoing use of sanctions as a political weapon, a kind of foreign-policy tool of choice. Even America’s closest allies are threatened by these restrictive measures. The recent attack on the Nord Stream 2 gas project is a good example. It’s only natural for other countries to be looking for ways to resist the US policy of twisting arms. Using alternative currencies and bringing gold home are ways to do that. America has always opposed such efforts. Any methods would do. Muammar Gaddafi, the Libyan leader, was toppled and killed after he came up with the idea to introduce a golden dinar to be used as an international currency in the Middle East and Africa. Iran has recently banned the use of the USD in trade. It refuses to sell its oil for the US currency. President Trump is likely to kill the Iran deal in May, provoking Tehran into reviving its nuclear program. An armed conflict with Iran might be much closer than generally believed. The nuclear deal has been honored, to everyone’s satisfaction but to Washington’s chagrin. Iran undoubtedly has no military capability that would be a threat to the US. It has never been responsible for any terrorist acts committed abroad or things like that. But it has done something unforgivable in the eyes of the US. It has threatened the USD. That’s what Washington cannot accept, because if it does not support the dollar, there will be problems financing the US government’s huge federal debt. A war with Iran would eliminate the largest non-USD oil exporter. One thing leads to another. The gold repatriations are a precursor to a currency war and armed conflict. That’s what drives US foreign policy.